ASP Trustee Carmel Almendrala welcomed six participants to the family support group meeting held at Autism Society Philippines National Headquarters last 19 March 2016. ASP’s monthly family support group sessions bring together parents, siblings and other family members to talk about their journey in living with autism. 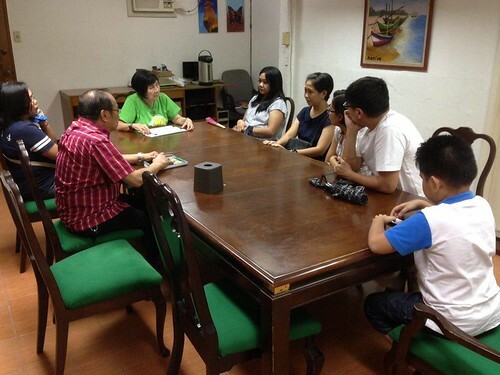 Carmel Almendrala sits at the head of our board room table, together with the family support group participants. Participants shared their experiences, articulated their aspirations as parents and drew enlightenment and strength from others going through the same challenges. Monitor our Facebook page at https://www.facebook.com/autismsocietyphilippines/ to find out when and where the next FSG will be. You can also find us on Twitter, Instagram, Google Plus and Linked In. About the contributor. Lloyd Ngo worked as an ASP intern when he attended Independent Living and Learning Center. He began working in 2012 as an encoder at the Ongkiko Manhit Custodio and Acorda Law Offices in Makati. He is currently ASP’s Jr. Program Assistant.